I get a lot of e-mail asking questions along these lines: "I've just purchased the amazingly beautiful new Bible you recommended. Now how can I take care of this thing so it stays pristine?" Sometimes I'm tempted to suggest dropping it from a second floor window. 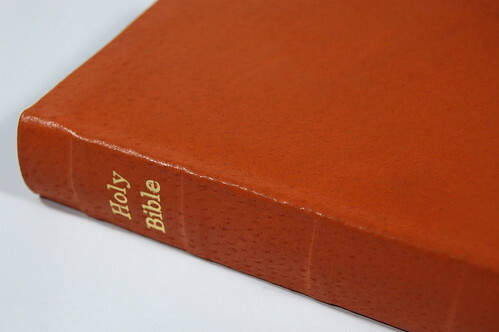 Not because the sudden impact will preserve the cover's glossy sheen, but because the resulting damage will make the idea of "taking care of" your new Bible seem silly. Don't get me wrong: I understand the impulse. And share it. But the reason to invest in a quality Bible isn't so it can look shiny and new for years to come. You spend the extra so, when you don't take care of it, the thing won't fall apart. 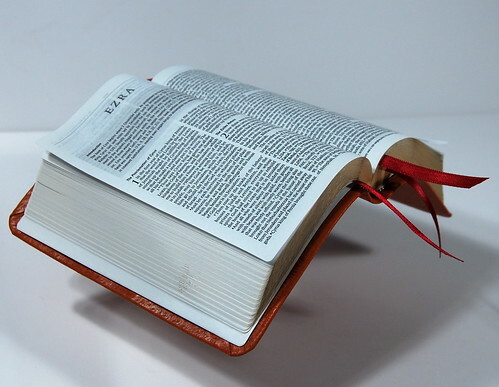 After all, if regular use turns into abuse and things get really bad, you can always have your Bible rebound. That's what I did recently, though in this case it was a preemptive rebind. I'll warn you now, it won't be to everyone's taste. But hopefully this will serve as a first-hand introduction to the subject of rebinding, and introduce you to an excellent rebinder: Leonard's Book Restoration. So what did I do? I had a Deluxe Compact ESV rebound in natural tan pigskin, simple as that. (In the photo above, you can see the result on top, compared to a vintage pigskin wallet below.) First let me explain why I chose the Deluxe Compact, and then we'll get to the pigskin. 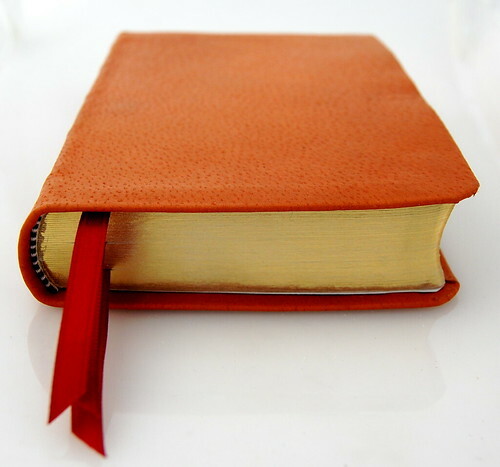 For years now, by bang-em-up, go-everywhere Bible has been one of the original Compact ESVs rebound in tan calfskin, which my wife ordered for me from LeatherBibles.com as a Christmas present. 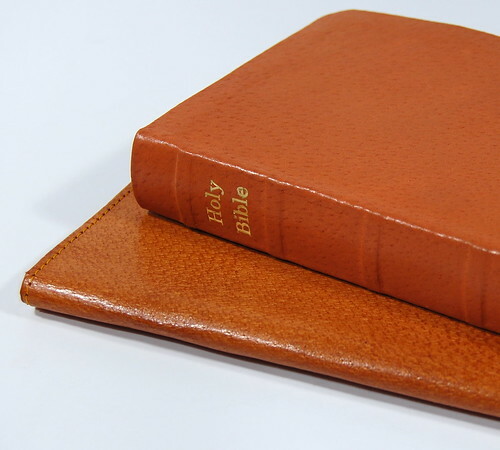 It's a rugged little Bible, giving the lie to the notion that there's anything "delicate" about quality editions, requiring special love and care. But it suffers from a couple of drawbacks, the main one being that the text is smaller than a Cold War microdot. Now I happen to like small type, because it goes hand in hand with a compact Bible. But even I think there's a problem when I'm holding a book six inches from my eyes just to make out the words. Crossway agreed, which is why they introduced the Deluxe Compact, which is ever-so-slightly larger than the original, with a darker, easier to read font. The moment it came out, I decided to upgrade. Sadly, while the Deluxe Compacts feature sewn text blocks, there wasn't a calfskin edition available. To replace my stand-by, I'd have to have the Deluxe Compact rebound. 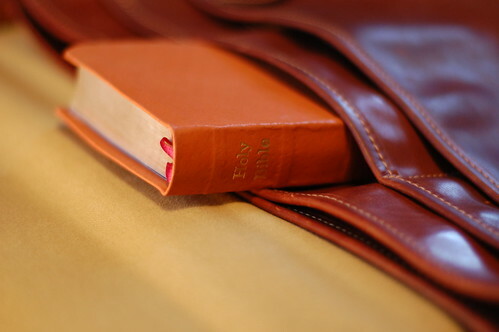 The goal from the beginning was practical: I wanted a durable, flexible cover for a Bible that will spend a lot of time stuffed in briefcase pockets (as below) or jumbling loose with other stuff. It might even be jammed in a jeans pocket and sat on from time to time like its predecessor. I'd discovered Leonard's recently, and I was impressed enough to get in touch. We exchanged e-mails and I found they had a nice natural tan pigskin. 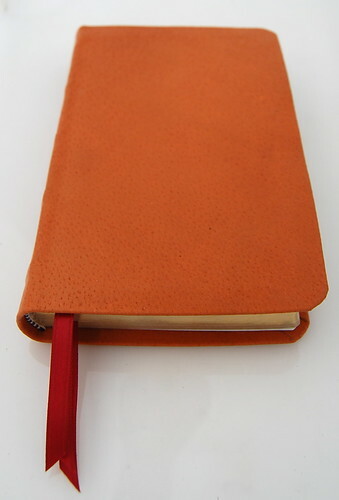 To give the cover the maximum flexibility, I opted for a thin suede leather lining. You can't see it, of course, because it's underneath the cover, but the results can be felt. Compared to other rebinds I've handled, this one is rewardingly suppled. The suede added $20 to the bill, but for me, it's worth it. Naturally, I opted for three ribbons. Why do I insist on three? It's pretty simple. Crossway's Daily Reading Bible comes with three, coordinated its three-part reading plan. 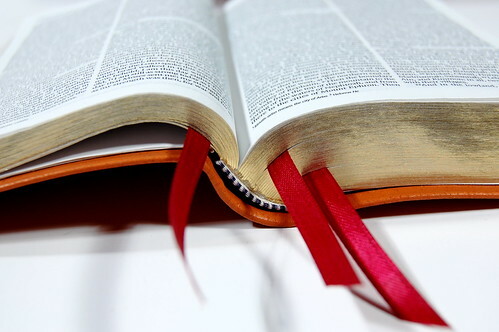 One ribbon stays in the Old Testament, one in the Psalms, and one in the New Testament. My old Compact had black ribbons and liners -- a bizarre choice for a tan Bible -- so this time I opted for wine-colored liners and matching ribbons. In the photos, the ribbons came out a little redder than in life, thanks to the studio lights. Above, the Deluxe Compact layout. Yes, there's bleedthrough. And in this photo you can see a little of the damage the text block picked up before rebinding, especially that odd anomaly in the gilding on the left-hand side. I'll say more about the text block in a bit. The workmanship is quite good. 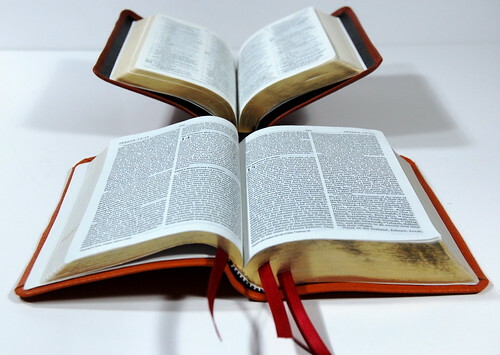 In the past, I've emphasized that there is often a certain "rustic" quality to rebound Bibles. Unlike the mass produced product we're accustomed to, these are individually made. They don't look like they just rolled off the assembly line. In terms of fit and finish, they can be slightly rough. But as you can see in the photos, this one has a polished look. And it feels as good as it looks. "Very soft," my wife commented the first time she handled it. 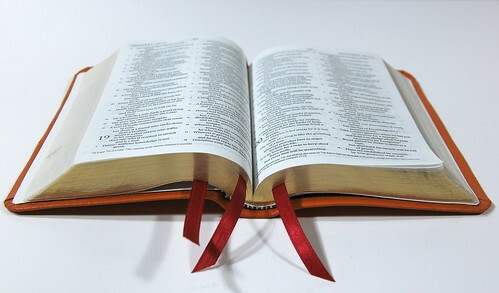 Flexibility is a hard thing to quantify, but I'd describe this Bible as limp without being "floppy." It doesn't pour out of your hand like a big Cambridge wide margin in goatskin, but it does shift and mold in a satisfying way. Perfect for a Bible this size. To try and illustrate this, I snapped the photo below with the Bible propped up at the spine. The cover curves gracefully downward. I didn't take the usual yoga photos, so let me explain why. This Bible curled up exquisitely into yoga poses, but the moment I put it down to photograph, it uncoiled. I wasn't fast enough to get a focused shot. But take my word for it, the cover is flexible. The photo below illustrates a couple of things. First, you can see wine-colored liners. The color is represented accurately, and you'll have to imagine the ribbons more in line with the darker shade. Once the light hits them, they brighten considerably. In life, it's a harmonious match. Second, note the little rip on the page. As I mentioned, I sent Leonard's the Deluxe Compact I'd been using for awhile, so it had some little nicks. It's also fanned out a little, which I've noticed on other people's Deluxe Compacts. As I said in the intro, this is a Bible for use. Part of me wishes I'd sprung for a fresh Deluxe Compact so everything would be perfect for awhile, but the reality is, this Bible's going to have a lived-in look before long, so why not now? My favorite photo of the rebind is below, because it shows off the pigskin grain so well. The color is tan, but it's a bright, orangey tan rather than a darker brownish one. I'm not sure whether it will darken with use or not. No doubt you'll be seeing more photos as it ages, so we'll find out together. Below, another look at the gilding. The gold doesn't last long on today's Bibles, I'm afraid. No use crying over it, but it does make me grateful for nice art-gilt edges. One thing I had on the original Compact that I didn't get this time around is a semi-yapp edge, which helps protect the page edges. There's some overlap, as you can see, but frankly I forgot to ask if Leonard's could do semi-yapp. When the new Bible arrived, the first thing I had to do was gather up the other brown and tan Bibles I had handy, just for comparison. First, I stacked the old and new Compacts on top of the old and new Allan's ESVs in tan highland goatskin. (The old Allan's is on bottom, the newer one on top.) Look at all the pretty grain. Then, I stacked up everything I had handy. From top to bottom: the LeatherBibles.com Compact in tan calf, the Deluxe Compact in tan pigskin, the Allan's Clarendon KJV in brown water buffalo calf, the Nelson Signature NKJV in tan calf, the new Allan's ESV in tan highland goatskin, the original Allan's ESV in tan highland goatskin, Crossway's Thinline ESV in cordovan calfskin, and the Classic Reference in cordovan calfskin. 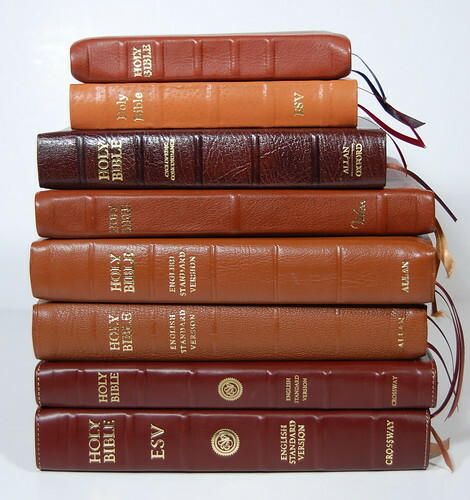 I believe the LeatherBibles.com Compact, the Nelson Signature, and the two cordovan calfs were all bound by Abba Bibles in Mexico, so the photo gives you a comparison of their work, Allan's, and the example from Leonard's. Most of the rebinding projects I highlight on the site are someone else's. Since I don't get to see the vast majority in person, I'm not in a position to comment. 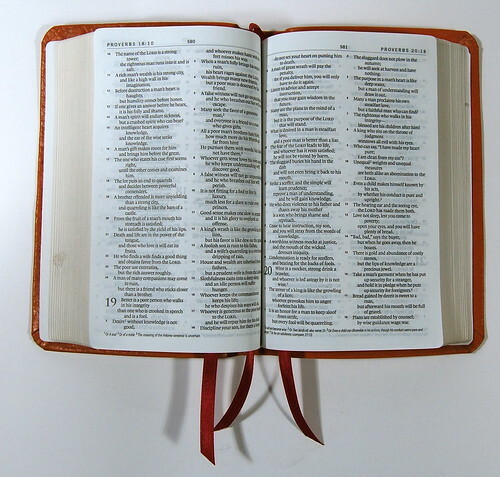 Hopefully you've appreciated this more in-depth look at a rebound Bible. One of my goals is to do more first-hand reporting on rebinding in the future. In closing, a little advice for those thinking about having a Bible rebound. (If you've gone through the process yourself, feel free to share your insights in the comments.) First, have realistic expectations. Second, avail yourself of the list of Rebinding Links in the right hand column. Explore the sites, get in touch with the rebinders, ask all your questions. Third, look at all the rebinding projects highlighted on the site for an idea of what to expect from each rebinder. Then make your choice, send your Bible, and wait. My experience with Leonard's was excellent. We had a thorough, detailed correspondence in advance, and they were great about updating me on progress along the way. From start to finish, it didn't take much more than a month, and the cost for a project like mine was just under $100 shipped.